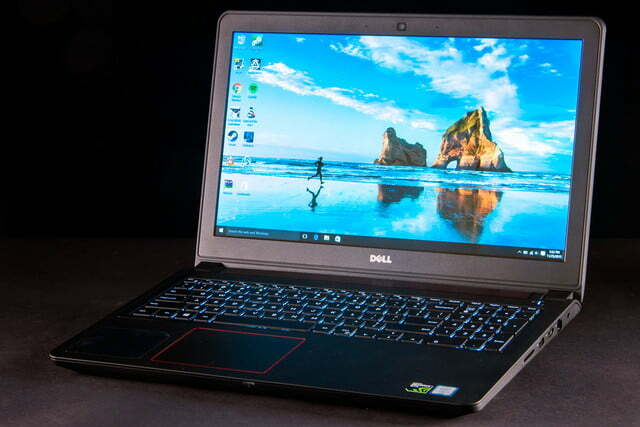 Dell's Inspiron 15 7000 proves a jack of all trades isn’t always a master of none. We’ve been reviewing Dell’s Inspiron line of mid-range computers for some time now, and while they fill an important role, they usually aren’t exciting. 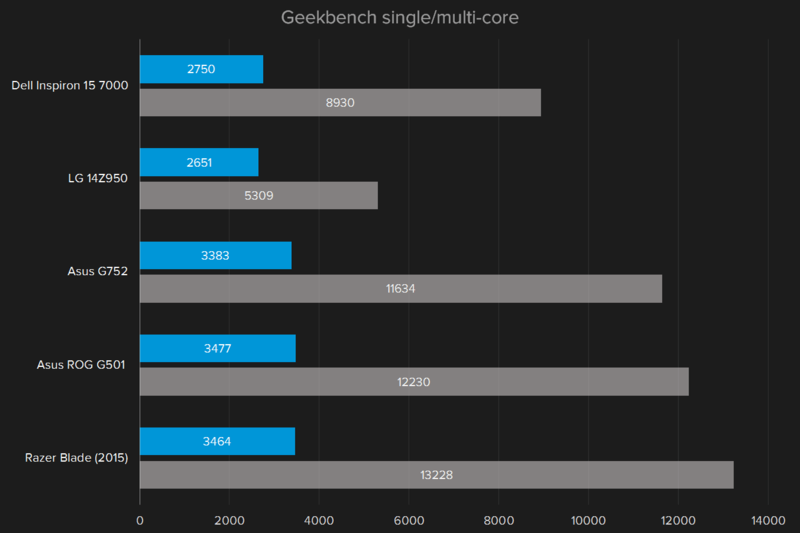 In fact, I can almost guess the specs of the new Skylake version without looking. A Core i3 processor, 4GB of RAM, a small mechanical hard drive, and so on. But this Inspiron doesn’t follow the normal script. 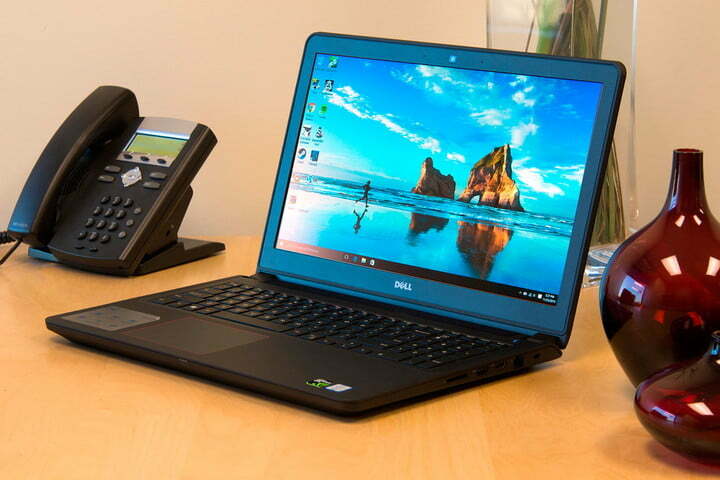 This time around, Dell has surprised us with a real improvement to the specifications and capabilities of the Inspiron line, which comes courtesy of an Intel Core i5 quad and Nvidia’s GTX 960M. Also surprising are the storage options, which are more limited, but quicker, than in previous models. Most models include a 1TB hybrid drive with 8GB of NAND memory, while the high-end models offer both a 128GB SSD and a 1 TB HDD together. Those changes, along with a soft-touch black finish, mean this year’s Inspiron 15 7000 is a more serious contender than usual. It has a new-found slant towards gaming, yet remains affordable, at just $800. Can it hang with monstrous, gaming-focused performance sharks, or is it a little fish in a big pond? 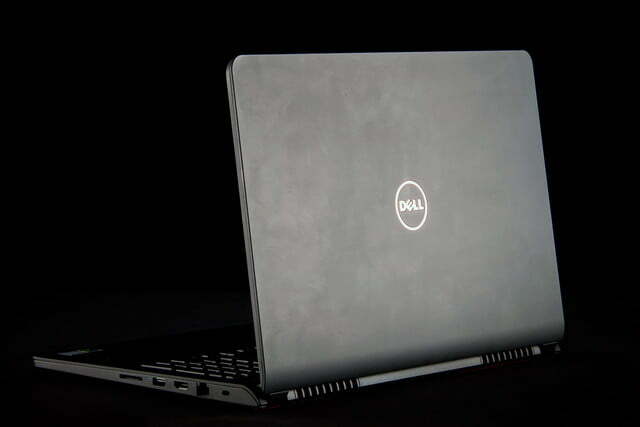 It’s refreshing to see that Dell isn’t afraid to muck about with design. This new iteration sports a soft-touch, black matte coat that’s entirely opposite previous models, which favored rigid metal accents. 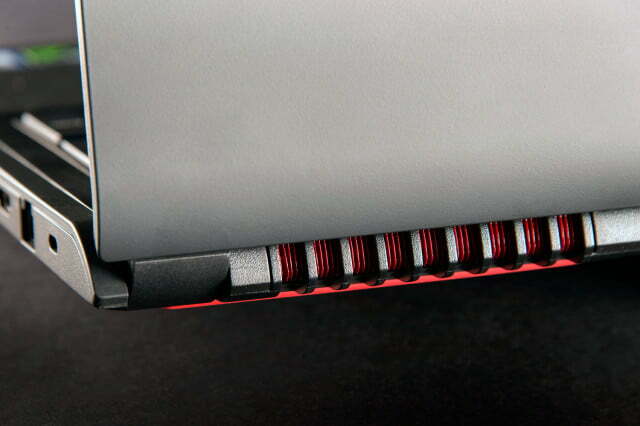 Red accents hint at the system’s gaming capabilities without going over the top. Unfortunately, while build quality is quite nice on the lower half of the computer, the same quality doesn’t carry over to the upper portion of the system. 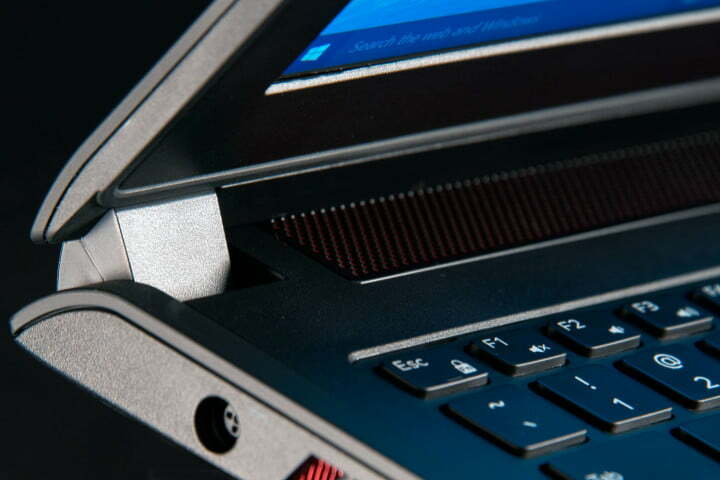 The LCD panel flexes easily, bending and discoloring when held underneath the system. The top edge is worse, and even touching it lightly causes uncomfortable twisting and discoloring in the display. Luckily, the problems are reserved to the display and its bezel. The bottom half of the laptop feels rigid and sturdy, and doesn’t bend or flex under pressure. There’s also plenty of space in front of the keyboard, which acts as a comfortable wrist rest when in use. 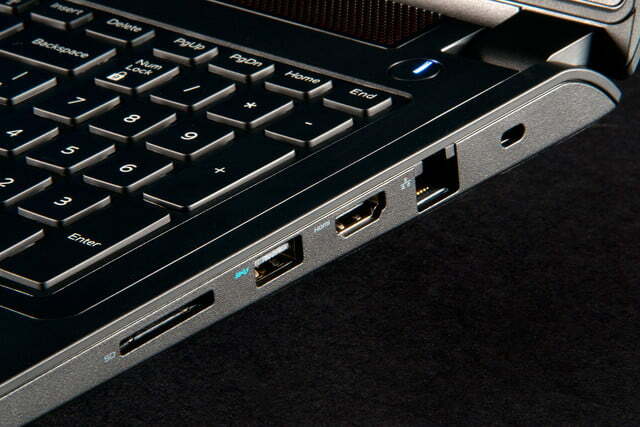 Ports are the standard selection for a laptop this size. 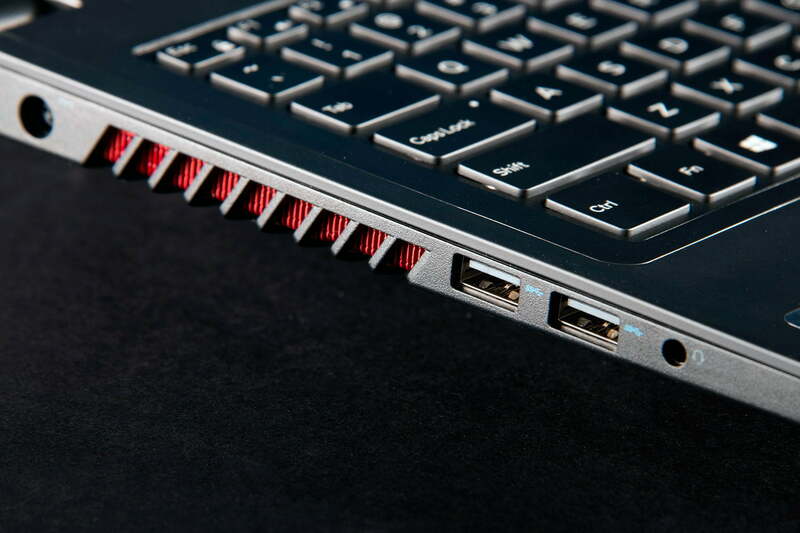 Two USB 3.0 adorn the left side, along with a 3.5mm headphone/microphone combo jack. The right side houses another USB 3.0 port with PowerShare, along with HDMI, Ethernet, and an SD card slot. It’s no surprise that the inputs on the Inspiron are refined and easy to use, considering how long Dell has been making laptops. Despite a short throw, the keys have a satisfying click and quick springing action, and Dell manages to squeeze a full-sized numpad in as well. Nvidia’s GTX 960M is a welcome addition to this updated machine. 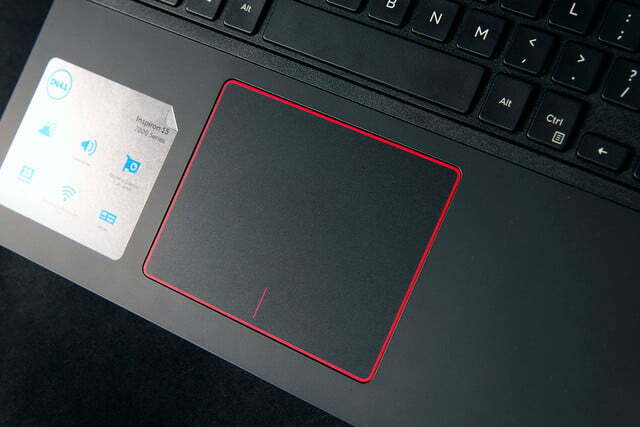 The touchpad is expansive and has a slightly slicker surface than the rest of the chassis, with a defined ridge around the edge that will keep your fingers from straying too far. The buttons are integrated, but that doesn’t stop them from offering up a distinct click, and a painted line separates the two sides of the button. There’s only one issue — mechanically, one touchpad button won’t work if the other is pressed. That means no shooting when zoomed in a first person shooter. Admittedly, that’s a niche situation, and most gamers will use an external mouse anyway. 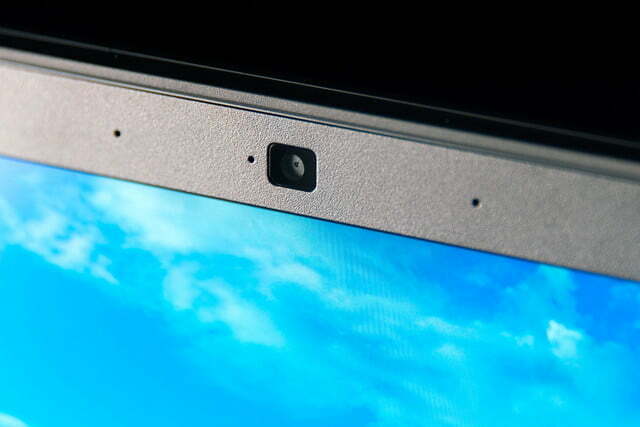 Dell makes no guarantees when it comes to the display in the Inspiron, as doing so would only serve to disappoint. It’s the second worst display we’ve tested recently, coming in well above the Digital Storm Triton’s unfortunate panel. Brightness is a low 186 lux even when turned all the way up, well short of the brightest laptop displays, but right in line with the screen on the XPS 13. Black levels are decent at lower brightness, while contrast and color accuracy are both middling. Color gamut is a low point for the display, at just 64 percent of sRGB. Most displays exceed 90 percent. Those numbers translate into a subpar media and gaming experience. Colors don’t have life to them, looking flat and muted on the screen. Blacks and grays blend together frequently, and dark scenes go no deeper than a murky gray. Games that rely on inky black corridors, like horror titles, suffer the most from this flaw. The speakers help make up for the display’s shortcomings. The bar that runs the width of the computer just behind the keyboard produces loud, clear sound, even at maximum volume. There isn’t a lot of bass to speak of, but music maintains a smooth, clear quality. The engine of the Inspiron is Intel’s Core i5-6300HQ, a quad-core chip with a base clock of 2.3GHz, but without Hyper-Threading. It’s certainly nice to see something with a little more get-up-and-go than a dual-core in an affordable system, and it really shows in the overall performance of the system. Placed head-to-head with full-blown gaming systems, the Inspiron doesn’t look that impressive, but it’s important to remember that the price is less than half of some of the competing systems. Its quad-core performance is a bit lacking compared to the single-core performance, but that’s likely attributed to the chip’s 45 Watt TDP and lack of Hyper-Threading. Unfortunately, costs have to be cut somewhere to bring the price down so low, and one of those areas is the hard drive. While solid state drives have become the norm in most systems, the Inspiron takes a middle road with a 1TB hybrid drive (aka SSHD) with 8GB solid state cache. This Inspiron cuts all the right corners. Unfortunately, it doesn’t keep up to dedicated SSD performance, and even falls short of other portable mechanical drives. At a painfully slow 105 MB/s read and 105.5 MB/s write speed, it’s closer to the cheap eMMC drives found in ultra-portable devices. That sounds rough, but it’s worth noting that the way a hybrid hard drive works affects the results. SSHD drives constantly track the most used files, loading them to the 8GB cache for faster reading and writing. The first couple of tests were much lower than the average results, but running the test a few extra times revealed a speed plateau. Still, in real world, everyday use, the SSHD proved its worth. 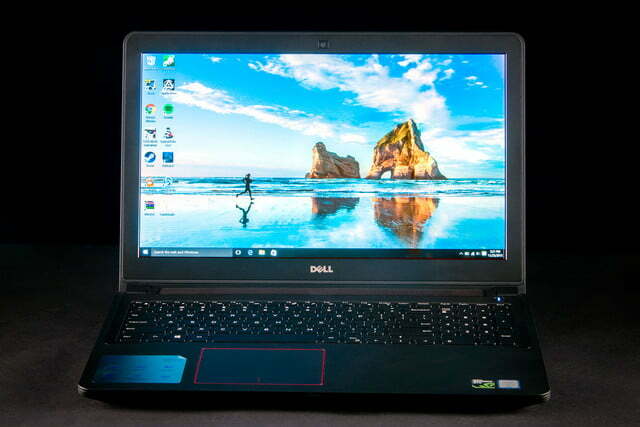 It loaded frequently accessed programs with the near-instant response expected from a normal solid state drive, which helped the Inspiron feel responsive. The drive’s lackluster read/write speeds are only an issue when moving large files. 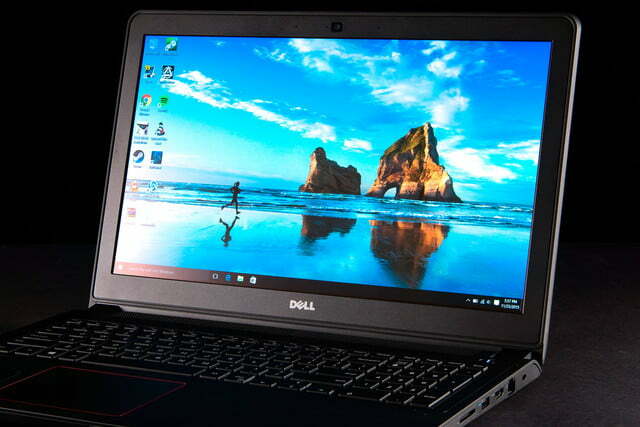 We don’t expect an $800 laptop to be a gaming superstar, but the Inspiron’s specifications suggest it has a lot to offer. 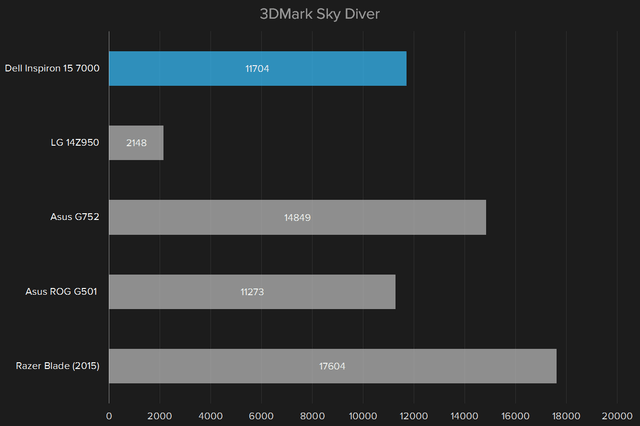 Before we can dive into the tough stuff, though, let’s take a look at 3DMark. 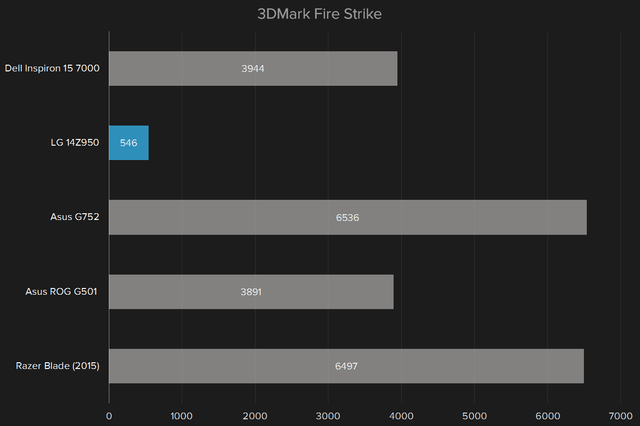 The Inspiron’s score on the demanding Fire Strike test sets it well apart from budget laptops, and anything with integrated graphics. 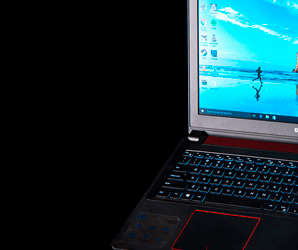 It even beats out the similarly-equipped, but twice-as-expensive, Asus G501J. What’s most important is real-world performance, though, and we put the Inspiron through a gauntlet of modern titles. 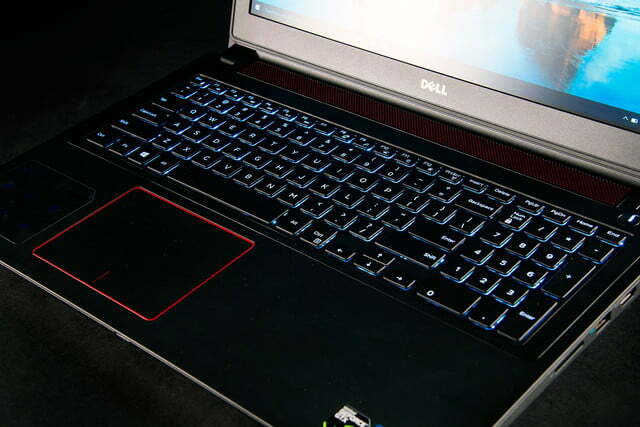 While it won’t set any records, the Inspiron 15 7000 proves a capable performer for the casual gamer. 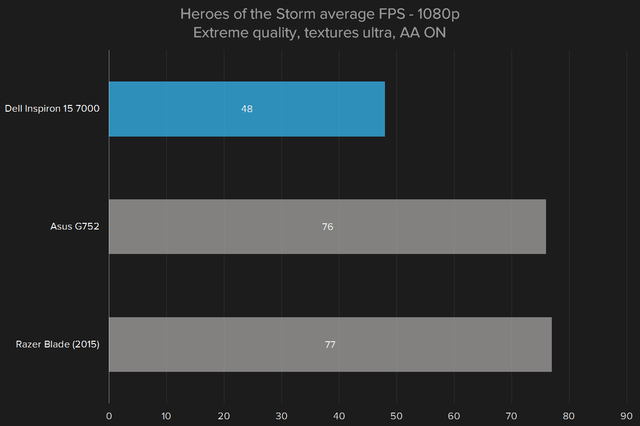 It has trouble reaching the ideal target of 60 frames per second in the latest titles with everything turned on, but is comfortable even at the higher graphical settings of popular titles like Heroes of the Storm and Counter-Strike: Global Offensive. As a new addition to our benchmark suite, we don’t have enough relevant systems at the moment to compare to the Dell in Fallout 4. That being said, the system averages 48 frames per second at 1080p with the settings at medium and anti-aliasing set to FXAA. 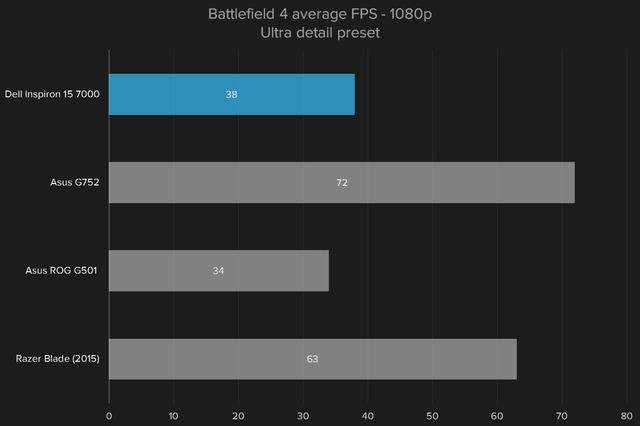 Turning the settings all the way up to ultra only brings the framerate down to 36. It’s not a top score, but it’s very playable. Like most systems, the Inspiron struggles with the demanding Crysis 3, averaging a playable 37 frames per second at medium settings on 1080p. Turned up to very high, and the game becomes a slideshow 14 frames per second, but we didn’t expect it to keep up with the dedicated desktop rigs. Fast, budget-friendly machines often sacrifice portability to achieve those advantages, and that’s certainly the case with the Inspiron. At one inch thick, and five and a half pounds, it’s a bit bulkier than other 15-inch laptops in its category. It’s not in the same realm as hulking gaming laptops, however, which is a boon. It’s impressive to see a quad-core Intel chip in a system that sells for $800. A 74 watt hour battery is standard in the Inpsiron 15 7000. While that’s very large for any notebook, it’s ultimately overmatched by the laptop’s quicker processor. The Peacekeeper browser test loop ran for four hours and 32 minutes before calling it quits. It fared a bit better in a web browsing loop, staying awake for four hours and 56 minutes before succumbing to exhaustion. That’s not enough to see the Inspiron through a full day at the office without bringing along a charger, but it’s also about average for the category, and a lot better than most gaming laptops. The Inspiron isn’t a cool customer despite its oversize chassis. Heat congregates in the typical areas, at the far side of the keyboard, and underneath near the back of the system. While the top stays under 110 degrees fahrenheit, the underside breaks 115 easily, and pushes 120 during gaming. It’s not the hottest system we’ve seen, but it’s certainly uncomfortable. But the system is quiet. Even when it’s cooking, the fan doesn’t reach volumes that are loud enough to distract. It barely breaks the ambient noise floor in our test room, pushing 40 degrees Fahrenheit with Fire Strike running. The speakers are more than able to overcome that small amount of noise, and any headphones are sure to tune it out as well. Thankfully, Dell doesn’t try to make up profit margins by packing machines with extra bloatware. There are a few Dell applications that ask to handle data backup and offer cloud services, but unlike some brands, they’re easy enough to shoo away. Dell offers a choice of 30-day trial or one year of Mcafee, but charges $50 for the version with anti-virus, which we don’t recommend. Dell provides a one year limited warranty on all of its laptops, the standard offering for almost any laptop regardless of price. Don’t game on a touchpad! Razer’s travel mouse is tiny, and won’t break the bank. Take advantage of the portability of the Inspiron with a classy shoulder bag. Keep it cool when the Inspiron doesn’t by adding an external cooling tray. Need a little extra storage? This Samsung SSD is small and inexpensive. 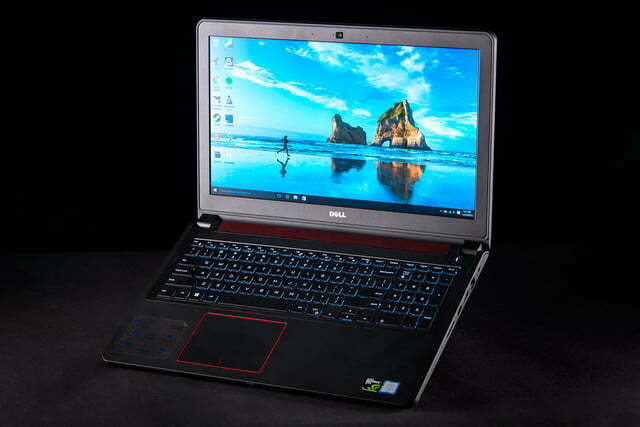 This year’s Dell Inspiron 15 7000 shows that no laptop is without its compromises. The display is unsatisfactory, the build is flimsy in some places, and the mechanical hard drive leaves much to be desired, but ultimately these corners are the right ones to cut in search of a solid budget laptop. We’ve seen wallet-friendly machines that skimp on the processor or cheap out on build quality, and it dramatically affects day-to-day use of the machine. 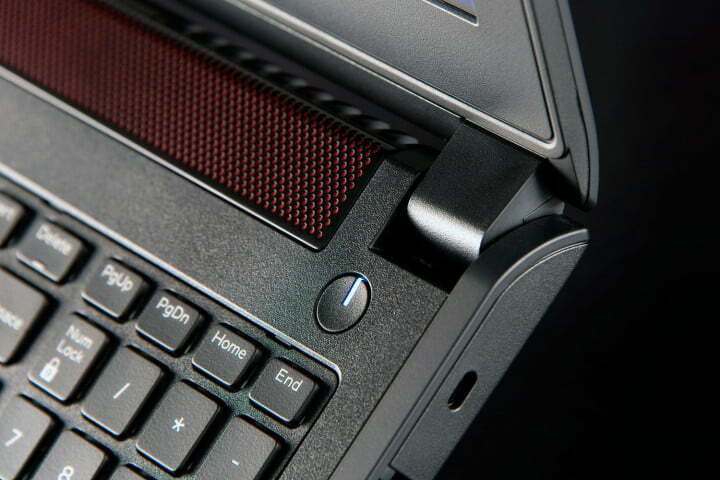 Instead, the Inspiron places its efforts in the right places, and it pays off in a number of ways. 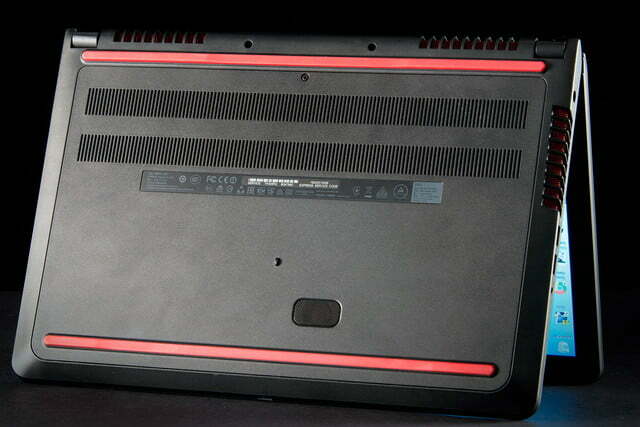 It can’t keep up with the high-speed performance of the dedicated gaming machines, like the Asus G752, the Inspiron is a more practical day-to-day computer. The Dell compares even better to smaller game systems like the Razer Blade and Asus’ Zenbook NX500J, offering 80 percent of the performance at far less than half the price. The new Inspiron 15 7000 isn’t just a mid-range computer for college students and people who buy computers off the shelf at Best Buy. This year’s update is a great jack of all trades. It can work, it can play, and it doesn’t cost an arm and a leg.